Thread: Devinci 8Flat8; good buy? 2005 Devinci 8 flat 8, 888 vf forks, manitou metal rear shock, all race face components, hayes nine brakes, maxis minion DH tires, E13 w/ supercharger. Some scrathes, but the guys says its been kept inside and the scratches are from normal wear and tear riding in British Columbia. Good deal for $820USD plus shipping??? Has anyone ridden one? These bikes are still produced and distributed ONLY in Canada. The guy said its a beast and is super plush, but handles slow technical stuff well too. Either way I'm planning to put a Roco R on it as soon as I get it and later replace the 888 VF on it with a new model Totem, 888, or Boxxer. Well its a used downhill bike, I'm not expecting it in showroom condition. For under a grand??? 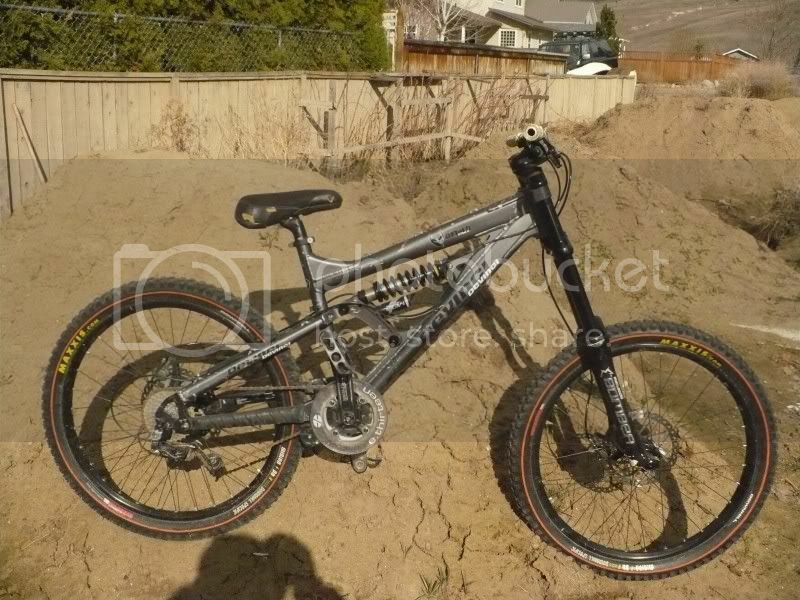 Definately needs a new seat, but sounds like a decent deal for a complete DH bike. I dont know much about DH yet, but Ive been looking at frames and they arent cheap. a buddy of mine is selling his 2005 ollie - which is essentially the same frame - with a better parts spec and he's looking for $2200 CAD. i'd say $850 USD is decent. i'd make him sell it to you without that seat. my god, what an abomination. "M.C. for what I AM and do, the A is for Adam and the lyrics; true"
you can try a search for broken Wilson/Ollie/8 flat 8 frames....just surfing many different sites (canadian sites) i dont recall reading anything bad about them, maybe just a high BB!! i think its a good buy! Definitely worth it. Might look a bit beat up, but those frames are tough. If anything, it'll possibly need new pivot bearings and ride as good as new. I have an '06 8F8 that gets used mainly for rough east coast (Quebec) dh and love it. There's lots of those frames around here.